The lead singer of the band Matty Healy has gone through quite a turbulent last couple of years as he battled a heroin addiction and eventually had to spend about two months at a rehab clinic in Barbados in 2017. He openly discusses his relationship with his addiction throughout the new album in an honest but artistic way through his lyrics. 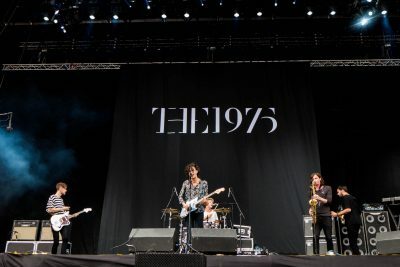 Described by Healy as having elements of U.K. garage, The 1975’s third album may sound unfinished or rough around the edges to uninformed listeners. However, a closer look at the lyrics show the deep thought and social commentary that the band provides through their music. “Love It If We Made It” is the standout track from this album. Healy’s vocals power through the song over a dreamy synth background that serves as an anthem for the youth who feel hopeless in the society that we all live in. “Modernity has failed us” is a lyric that appears multiple times during the song, conveying the idea that people are going to suffer because of the toxic competition and standards that people have in society. The song has an ability to make its listeners feel young and emotional regardless of what age or gender they are and almost provides some sort of hope to a generation that is hopeless. “I Always Wanna Die (Sometimes)” is another song that evokes the same emotions present in “Love It If We Made It,” as it characterizes the loneliness and isolation that people in this generation feel with the development of social media and technology. Healy sings, “Your memories are sceneries for things you said / But never really meant,” meaning that people always have big dreams growing up, but once they look around and see what other people are doing, their dreams seem so far and unattainable — something that they never meant in the first place. In a generation that has become dependent on technology and obsessed with unattainable perfection, “I Always Wanna Die (Sometimes)” conveys the negative emotions that people feel when confronted with the perfection that is always present on social media. With the clever songwriting and dreamy instrumentals throughout the album, there are a couple of songs that were disappointments and probably should have been left out. “I Like America & America Likes Me” was written as a tribute to SoundCloud rap, because Healy felt that SoundCloud rap is currently what characterizes the American music industry. For someone who writes such poignant and thoughtful lyrics, it was extremely puzzling why Healy would write about such a genre that is full of untalented musicians and horrible music. The heavy Autotune and overused trap snare present throughout the entire song did not really help his case, either. Another low point in the album was the song “Inside Your Mind,” which is a track about a possible lover. With great songs like “Love It If We Made It” and “I Always Wanna Die (Sometimes)” and their upbeat instrumentals, it really makes the slow songs like “Inside Your Mind” stand out, and not in a good way. Healy’s voice does not sound strong enough to be able to carry out a slow track with minimal instrumentals and, therefore, makes the song sound like an unfinished demo rather than an actual track on an album. Of course an artist should be able to experiment with different sounds and genres, but with such great upbeat songs on the album, it is puzzling why The 1975 wouldn’t incorporate more of those types of songs. Overall, “A Brief Inquiry Into Online Relationships” was an album that further separates The 1975 from any other band in the music industry right now. In an era where bands like Maroon 5 are making the most generic music possible and still somehow topping the charts, it is refreshing to see bands like The 1975 experiment with their sounds and tell their stories in a way that no other band could.